Back in September 2014, I created a series of maps for Matt Elliott, journalist at Metro, blogger, city council observer, and all-round great guy. Elliott’s City Council Scorecard tracked how each councillor voted on major decisions at city hall, along with a “Ford Nation” score that measured how closely each councillor voted with the mayor. Matt’s Council Scorecard was one of several inspirations for the work that I undertook so far on this blog, especially mapping the results of the 2014 municipal election. On April 24, Elliott published a new edition of his excellent scorecard, a check-up on how Tory has been handling council so far. I wanted to map the new scorecard and compare it to Ford’s performance. You can read more about Elliott’s methodology here. In 2011, newly elected Mayor Rob Ford was able to count on the support of 22 councillors — a slim majority on the 45-member council when the mayor’s vote is added. From that bloc, Ford was able to pick his executive committee, who helped push forward his agenda of cost-cutting and mucking up Toronto’s transit plans. 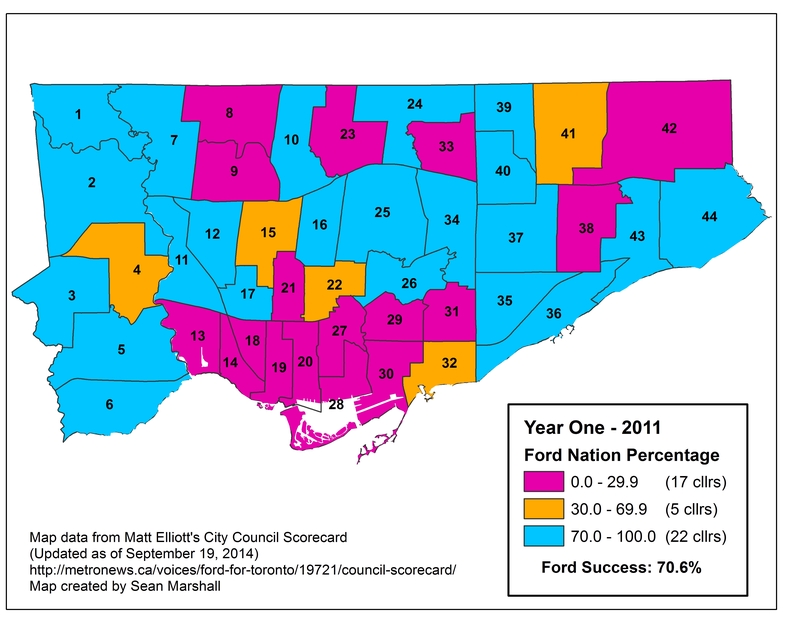 That year, council voted with Ford over 70 percent of the time. But by December, Ford’s control was already slipping; several potential proposed service cuts were rejected, as well as Doug Ford’s ridiculous plans to take control of the Waterfront development and build a Ferris wheel and mega-mall in Toronto’s Portlands. Many of the city councillors opposed to Ford’s agenda — but not all — were elected in wards representing the Old City of Toronto and East York. But six suburban councillors — Maria Augimeri, Anthony Perruzza, John Filion, Shelley Carroll, Glenn de Baeremaeker and Raymond Cho — were all reliable opponents. Except for Cho, who ran for the provincial Progressive Conservatives and lost in the 2014 election, the rest identified with either the Liberals or New Democrats and re-elected in 2010 despite their wards voting overwhelmingly for Rob Ford. It’s important to note that the Ford brothers’ agenda and control over council fell apart even before the Garrison Ball debacle and the crack-smoking allegations and council meltdown of 2013. In 2012, Rob Ford was only able to count on the loyal support of 17 councillors; he only had a 32 percent success rate at council that year. By 2014, Mayor Ford could only count on two reliable allies — his brother Doug, and Ward 7’s Giorgio Mammoliti; council only voted with the mayor 24 percent of the time. John Tory was elected in 2014 on an uninspiring, yet effective centre-right campaign, promising better governance, limited tax increases, and his own problematic transit plan. But after four years of Rob and Doug Ford, voters were looking for change. Sadly, candidates running on more substantive/progressive platforms, such as early front runner Olivia Chow and former councillor David Soknacki, either dropped out of the race or came far behind second-place Doug Ford, Rob’s obnoxious and bigoted enabler. Only five months into his term, John Tory had a good, but not stellar, record of getting his agenda through council. Matt Elliott found that 25 councillors have been reliable allies of Tory; voting with the mayor at least 70 percent of the time, including 5 of the 6 new councillors elected. Only six councillors — Gord Perks, Mike Layton, Joe Cressy, Kristyn Wong-Tam, Paula Fletcher, and Janet Davis, all representing “downtown” wards — have voted with the mayor less than 30 percent on all important votes. Other anti-Ford councillors, so far, find themselves part of the “mushy middle” or “mighty middle,” though they are at this point a minority of 13. 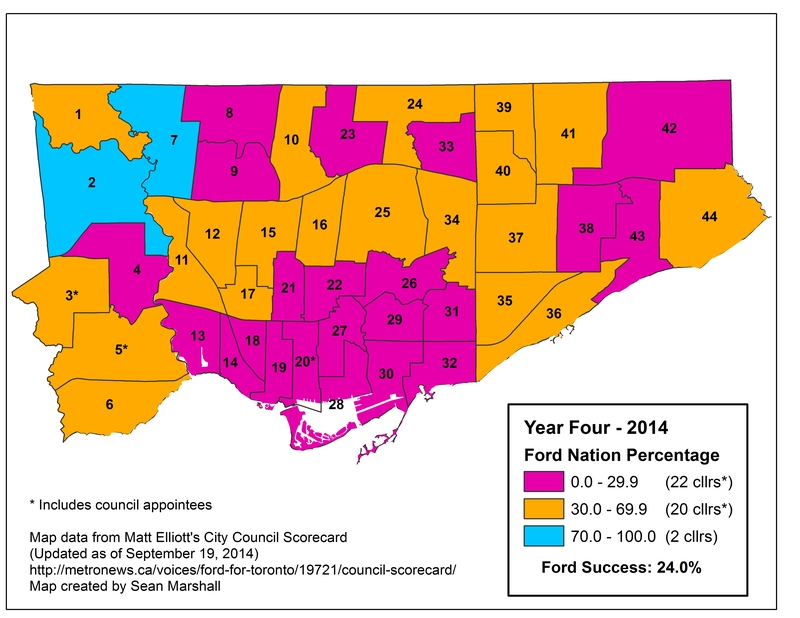 Interestingly, Councillors Rob Ford and Giorgio Mammoliti are voting with Ford most of the time so far. So much for Ford leading an “official opposition” against Tory. As expected, councillors that John Tory endorsed and supported in the last election — Christin Carmichael Greb in Ward 16, Jon Burnside in Ward 26, and Mark Grimes in Ward 6 — were among Tory’s most loyal votes on council, even though none got a plum appointment (Carmichael Greb and Burnside are rookies, Grimes a three-term councillor). All three faced challenges from qualified, less conservative opponents. John Tory’s budget and early agenda has been less confrontational and ideological as what Ford pushed in 2011; this could be helping his score. Left-leaning councillors like Joe Mihevc (Ward 21) and Pam McConnell (Ward 28) are, for now, voting 35 percent with the mayor. The budget approved by council keeps tax increases low (I’d argue unsustainably low), but TTC cuts implemented by Rob Ford are being reversed; no services are being slashed. It’s true that council not doing enough on policing issues (especially carding/racial profiling; Tory doesn’t seem to have any interest here), nor is there enough action on the TCHC’s capital repair backlog, but so far, there haven’t been many divisive votes. John Tory’s budget and early agenda has been less confrontational and ideological as what Ford pushed in 2011; this could be helping his score. Left-leaning councillors like Joe Mihevc (Ward 21) and Pam McConnell (Ward 28) are, for now, voting 35 percent with the mayor. The budget approved by council keeps tax increases low (I’d argue unsustainably low), but TTC cuts implemented by Rob Ford are being reversed; few services are being slashed. It’s true that council is not doing enough on policing issues (especially carding/racial profiling; Tory doesn’t seem to have any interest in this important matter), nor is there enough action on the TCHC’s capital repair backlog. But so far, there haven’t been many divisive votes. With upcoming labour negotiations and more big-ticket budget items (the decision on what to do about the crumbling and under-capacity east Gardiner Expressway, for example), this will change. At times, Tory has seen to be either ignorant or dismissive of how City Council works; had he known better, there would be someone else in the Speaker’s chair, a less polarizing deputy mayor, and a few more centrist or left-leaning councillors in key positions to unite council. Mid-term, in early 2016, there’s an opportunity for Tory to revisit his committee appointments if necessary. It’s very possible that Tory will lose political capital as the term goes on, though it is nearly impossible to imagine him losing control of the agenda so dramatically as Ford did. In any case, it will be interesting to see if Tory learns on the job and continues to have the confidence of council, or if he starts to lose his grip as most mayors experienced later in their terms. This entry was posted in Maps, Politics, Toronto and tagged City Hall, John Tory, Matt Elliott. Bookmark the permalink.